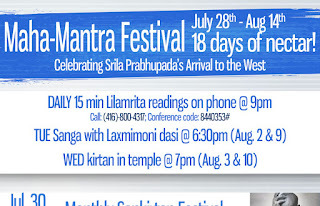 Maha-Mantra Festival - July 28 to August 14 ~ The Toronto Hare Krishna Temple! A lone, broke and aged man once embarked on a cargo ship to an unknown land. He suffered three heart attacks but what kept the him going was a mission which was not even his own but his guru’s. A perfect beginning to the history in making. Decades later he is celebrated on CNN as one of the top 10 successful men who launched their careers after 50. His Divine Grace A.C. Bhaktivedanta Swami Srila Prabhupada or simply Prabhupada, in a span of five decades, has inspired thousands and established hundreds of temples globally. Amongst his biggest contributions are the English translation of Srimad Bhagavad Gita, Srimad Bhagavatam and over 60 other titles that are now translated in over 80 languages. This year ISKCON centres all over the world will commemorate the arrival of Srila Prabhupada to the West from July 28th - August 14th. 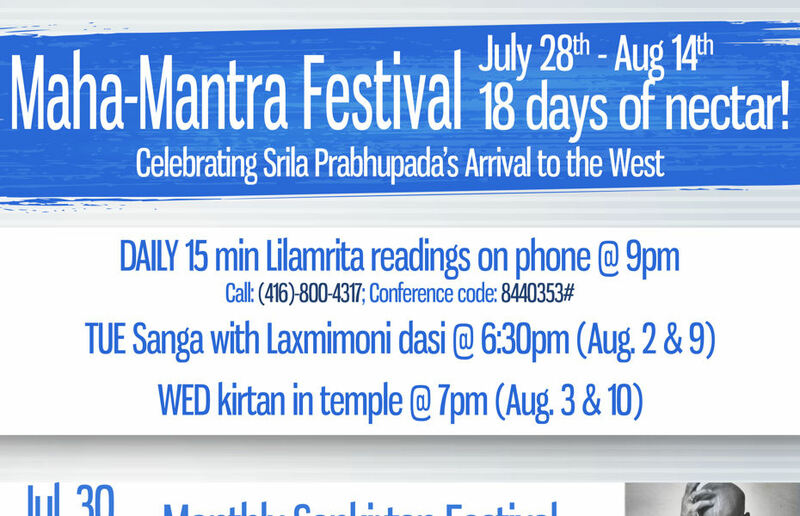 In Toronto, we will have an 18 day festival with a mix of a variety of events- seminars, Harinamas, readings and more. Also known as the 'World Holy Name Week', this really is a festival of gratitude and appreciation for what Prabhupada has given us via the medium of learning and sharing the (Holy) word! Be engaged in the following variety of ways. The festivities kickstarted with the right mood of welcoming the Holy names. It was a sweet evening and the Deities looked stunning in pink! The attempt of these kirtans will be to focus and meditate by diving deeper into the resonance of the Holy name in congregation. Join us for the monthly sankirtan festival, this month in honour of Srila Prabhupada's entrance to the Western world. We will continue to celebrate with more kirtan, prasad and smiles - this time with the residents of Toronto. Location TBD. So there is "reading a book", and then there is "studying with scrutiny". A gulf of difference between the two. We might have read some of Prabhupada’s books and thought them to be philosophically appealing; how about reading them in a light that would turn and transform your life? It is possible. It has happened and continues to happen. Come find out how. Kirtan is a collective prayer while japa or chanting on beads is a personal one-on-one. Here is a chance to connect deeper with the Holy name by chanting 32+ rounds with the support and association of others! We will head out to the Old City Hall, as we've done so in the past, and bring these positive vibrations to those in Downtown Toronto. There will be singing, dancing, jumping and lots of smiling. When Prabhupada came to the West, among the few sparse items that he brought with himself was a book of his translated Bhagavatam. 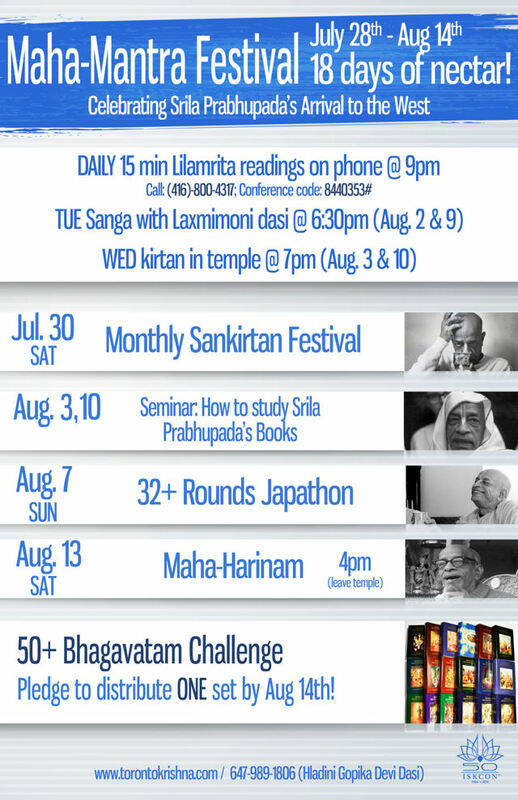 As a part of the ISKCON50 celebrations, embrace yourself with the 50+ Bhagavatam Challenge! All one needs to do is pledge to distribute one set by August 14th! 18 days of mindfully embracing the Holy names! See you there! For further information, please feel free to contact- Hladini Gopika Devi dasi: 647-989-1806 or email: toronto.sankirtan@gmail.com.